I headed to Binny's the other day with the intention of grabbing something in the $30-35 range, but with no real idea of what I wanted. After browsing through the bourbons and Scotches, I got to the rye section and came across Cody Road by Mississippi River Distilling Company out of Iowa. This is this craft distillery's rye offering, and one thing that I've learned is that, although they are usually young whiskeys, craft distilleries are capable of making some very good ryes. The fact that this was a Binny's Selected bottle only made my decision easier to give this a shot. I wanted something to drink around the fire that night in our backyard, and this really ended up being the perfect drink to complement the night. I don't know why, but I tend to enjoy a good, sweet and spicy rye outside in the evening. This rye is very good, surprisingly so since I had heard very little about it. 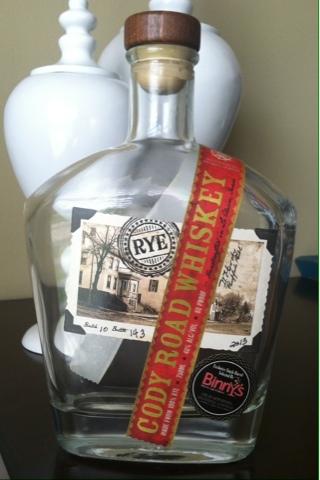 It's made from 100% rye and is only 80 proof, yet it is still full of flavor. It's a sweet rye, and surprisingly had some fruity notes to it, including very noticeable orange, cherry and apple flavors, distinguishing this from nearly every other rye I've tried. Of course, it still had the heavy and prominent rye spice to balance out the sweet, fruitiness, offering a mix of cinnamon and cloves. What I found unique and very enjoyable about this rye, though, was the light smokiness that followed on the back end. It's almost as though this whiskey hits you with different waves of flavor, each different but as enjoyable as the next. Although this is a young rye (the label did not provide an age statement, my guess would be it's 3 years old or less), it is very good, and it has a far more reasonable price point than other ryes produced by craft distillers. I wouldn't hesitate for a second to grab another of these off the shelf the next time I'm in the mood for a rye.